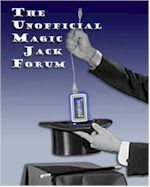 Is there free or inexpensive majic jack compatible software that automatically makes calls from a list and plays a pre-recorded message? Unfortunately that is a web based hosted solution. Yeah I realized the OP was looking for a PC based solution after I hit the send button. Sorry! an old software package called Talkworks pro software from Symantec did this and it worked with a voice modem, it was a PC based solution but it only works for Windows XP or older. You could also look at FaxTalk Messenger at store.getfaxing.com , it does fax and voice mail using a fax/voice modem.